A receptionist is s valuable assets of the boss and organization. Receiptionist is the first person callers meet when they arrive at an office. 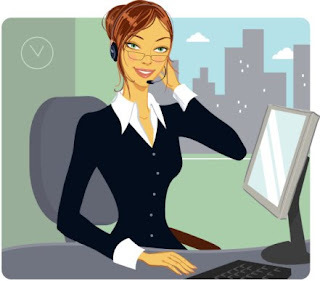 Receptionist is the person who is responsible to handle the callers or visitors at first in the office. The first impression that a visitor gets about the office or organization is through receptionist. Her main duties is to receive and asist the callers, who may wish to see a particular person or to make a general inquiry. a receptionist has to welcome the callers and ask them polietely about the purpose of visit. She must provide the necessary information to the visitors. She must posses some essential qualities. She must be smart and good looking. She must have pleasent voice, good persanality,and willingness to assist the visitors. Her courteous action and diplomatic action or treatment to the callers will create goodwill for both boss and office. She can maintain reputation of cordiality and service. A receptionist plays an important role in any office. Her main responsibility is to greet the callers, determining their purposes ,keeping the record of callers,putting the visitor at ease, turning the visitors away,refering the visitors,handling the executive,s appointment etc.